The materials presented uniformly consider physical-geographical regionalization and the landscape-typological structure of the Baikal basin. 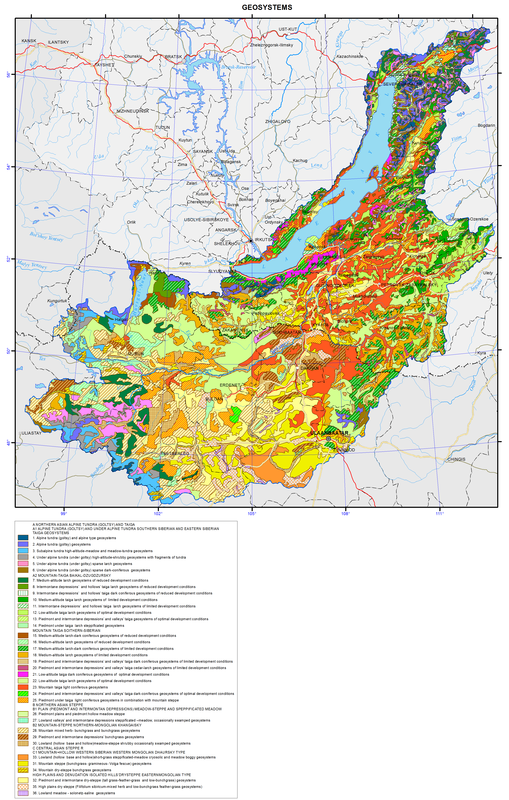 Map compilation was based on the idea of geosystems classification and the resultant works, including cartographic works on physical-geographical differentiation of the territory in the Russian Federation and Mongolia, which are presented below. The boundaries of physical-geographical structures (individual and typological) were integrally positioned on the same topographic base in the Mapinfo environment and verified according to the Landsat 7 multispectral satellite images (2000). The physical-geographical regionalization map reflects individual heterogeneous regional natural formations. The featured physical-geographical regions and provinces characterize the territories with a similar geographical location, manifestation of morphotectonic geological and geomorphological features, latitudinal, vertical and bioclimatic zonation. Physical-geographical regions, countries and provinces are comparable across different research. Mountain areas of North Asian mountain megalocation on the edge sphere of the continent (Baikal-Dzhugdzhurskaya and South-Siberian-Khangai-Khentei) and their contact with the Central Asian desert-steppe region of the Central continental megalocation are presented within this territory. Intraregional differentiation into provinces is related to the specific manifestations of altitudinal differences and geological and geomorphological features in mosaics of geosystem types and their mobile components of soils and vegetation. The map shows three physical-geographical areas and 12 provinces. Landscape-typological structure shows the features of spatial mosaic of individual physical-geographical units, their internal structure of relatively homogeneous combinations of physical-geographical conditions. In accordance with the small scale, 39 geom groups are shown on the map. The geoms are distinguished according to the indicators of topological order, but generalized to the regional level [Sochava, 1978]. They combine topogeosystems of the certain zone or belt (within a physical-geographical region) characterized by similar structural features of soil cover, vegetation and hydrothermal regime. The vegetational component of a geom is adequate to a formation, soil one is close to the subtype of soils, and the climate regime is close to the modification of climate of a subzone, which arose under the influence of the structural properties of other components. Geosystems specific to North and Central Asia form the regional classification range. Their location, interpenetration and uniqueness of landscape situations in the Baikal basin are presented. Regional interpretation of landscape-typological units (geom groups on the geasystem map) characterizes their latitudinal and altitudinal differences, as well as shows their relation to various regional and typological complexes of natural conditions that may be disclosed in detail on a larger display scale of landscape structures and geosystem components. Multiscale mosaic character of the natural-territorial structure determines the landscape complexity of the territory, the local "contrasts" of economic use, and specificity of different local options of development. Sochava, V.B. (1978). Introduction to the Theory of Geosystems. Novosibirsk: Nauka . Sib. Otd., 320 p.
Sochava, V.B. and Timofeev, D.A. (1968). Physical-geographical regions of North Asia. In: Reports of the Institute of Geography of Siberia and the Far East, vol. 19, pp. 3-19. Preobrazhensky, V.S., Fadeev, N.V., Mukhina, L.I., and Tomilov, G.M. (1959). Types of locality and natural zoning of the Buryat ASSR. Moscow: Izd-vo AN SSSR, 219 p.
Landscapes of the south of Eastern Siberia. 1:1500000 Map; Physical-geographical regionalization. 1:8 000 000 Map. (1977). Mikheev, V.S., Ryashin, V.A. with the participation of Bogoyavlenskaya, N.G., Vetrova, S.D., Dmitrienko, L.S., Zhitlukhina, T.I., Kosmakova, O.P., Krotova, V.M., Smirnova, D.A. Ed. by V.B. Sochava. Moscow: GUGK, 1977. Mikheev, V.S. (1990). Physical-geographical regionalization. In: Nature and environment protection in the Baikal watershed basin. Novosibirsk: Nauka. Sib. Otd., pp. 21-29. Mikheev, V.S. and Ryashin, V.A. (1967). Landscapes; Physical-geographical regionalization. In: Atlas of Transbaikalia. Moscow-Irkutsk: GUGK, pp.70-71, p. 76, text pp.172-173. Batjargal, B., Mikheev, V.S., and Erdenechimeg, Zh. (1989). Landscapes (map 39, text p.103). Physical-geographical regionalization (map 45, text p.104). In: Atlas of Lake Khovsgol. Moscow: GUGK. Fadeeva, N.V., Smirnova, E.V., and Tulgaa, Kh. (1989). Landscapes and natural zoning in the atlas of the MPR. In: The National Atlas of the Mongolian People's Republic (problematic and scientific content). Novosibirsk: Nauka. Sib. Otd., pp. 109-125. Dash, D., Smirnova, E.L., Tulgaa, Kh., and Fadeeva, N.V. (1990). Landscapes and natural zoning. Maps 145, 146 (scale 1:3 000 000) text p. 83. In: The National Atlas of the MPR. GUGK SSSR, GUGK MPR.